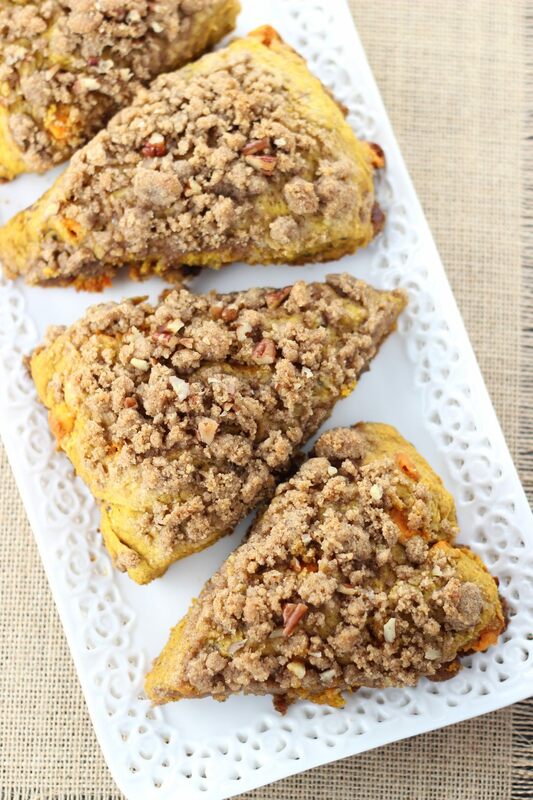 These Pumpkin Pecan Scones are loaded with pecans, and topped generously with buttery brown sugar streusel! The streusel is sent from heaven! 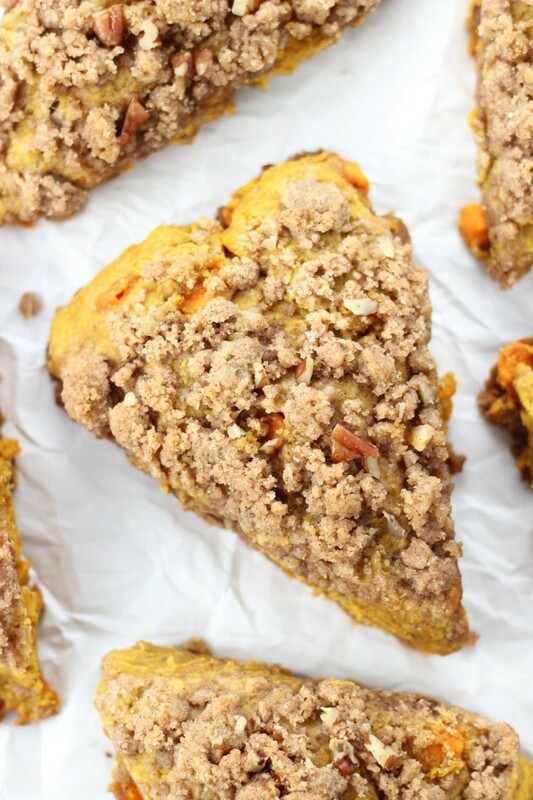 These Pumpkin Pecan Scones with Brown Sugar Streusel are SO MUCH BETTER than any bakery scone, and they’re EASY too! Happy Sunday!! Happy belated Halloween!! How are you feeling this morning, dear readers? I write this on Halloween morning, and hope that tomorrow morning (today) I’m feeling as chipper and well-rested as I do right now. At this point, my Halloween night could go 1 of 2 ways: a costume/bachelorette party, or handing out candy. Very different evenings. The house is currently very quiet, and I hope it foreshadows my evening! S.O. threw out his back so he’s sitting around in bed doing absolutely nothing. The cat is sleeping in her favorite bowl on the dining table and snoring. Yep. 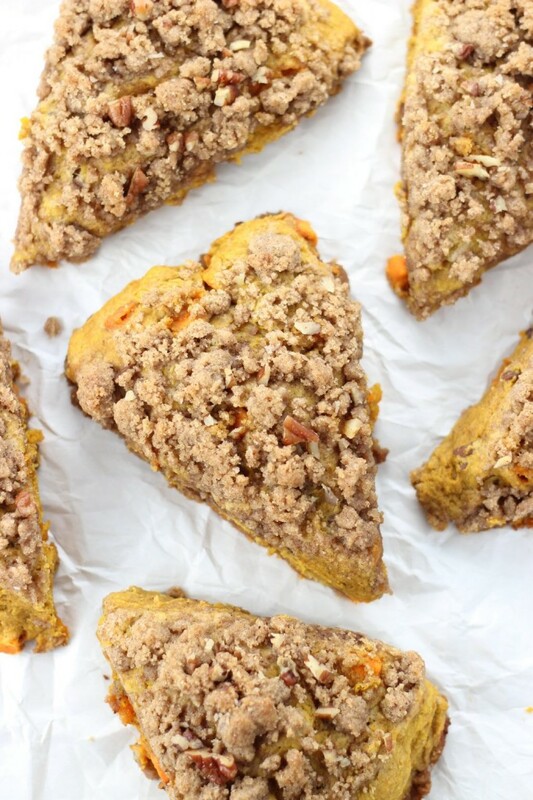 I have a nice quiet house to myself with a massive bowl of Halloween candy staring me in the face, a mug of freshly-brewed coffee, and leftovers of these Pumpkin Pecan Scones with Brown Sugar Streusel. It’s well-documented that I’m enamored with scones, and I just find that my basic recipe is SO versatile. I’ve made a number of variations on my basic scones, and they always turn out beautifully. I’ve got a ton now. 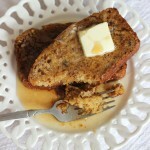 My personal #1 favorite or these Brown Sugar Maple Bacon Scones with Maple Brown Butter Glaze, but ALL my scones are amazing. I’ve got these Hazelnut Chocolate Chip Scones, Gingerbread Cranberry Scones with Brown Sugar Glaze, Chocolate Cherry Mocha Scones with Chocolate Glaze, Cranberry Orange Scones with Orange Glaze, Sweet Potato Pecan Pie Scones, Pomegranate White Chocolate Almond Scones, and even a few more…. 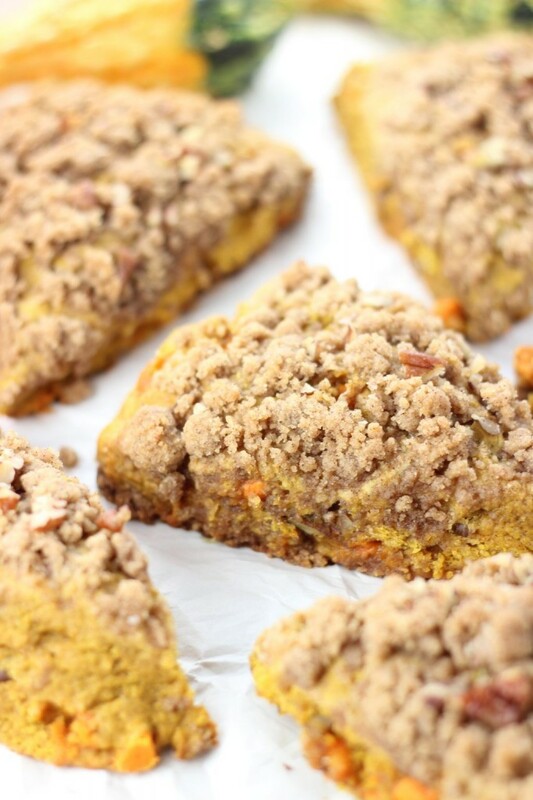 Is there anyone who doesn’t love a pumpkin scone? These Pumpkin Pecan Scones with Brown Sugar Streusel beat out any dry, crumbly, flavorless scones that you typically find in a bakery. Homemade is so much better, especially when it comes to scones. 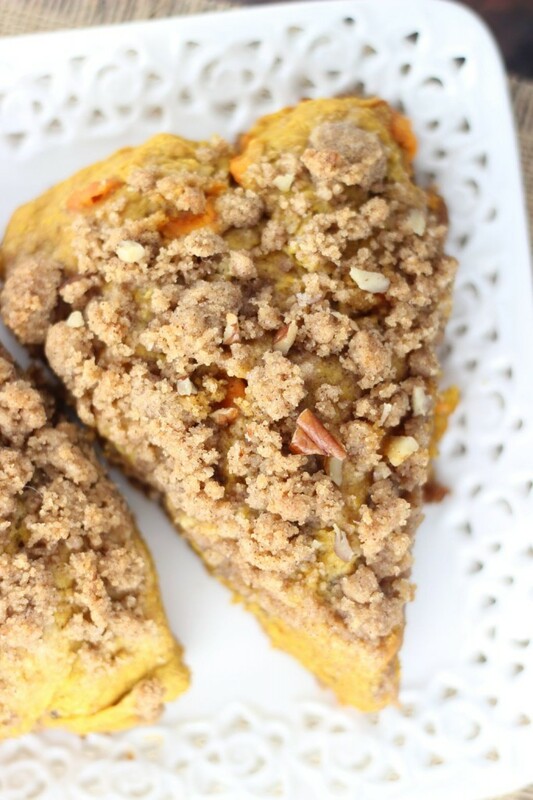 Even the Starbucks pumpkin scones that are all the rage… they have nothing on these Pumpkin Pecan Scones with Brown Sugar Streusel. These are flaky, tender, moist, and buttery. They practically melt in your mouth. They’re a little crispy on the edges, but are moist and soft inside. 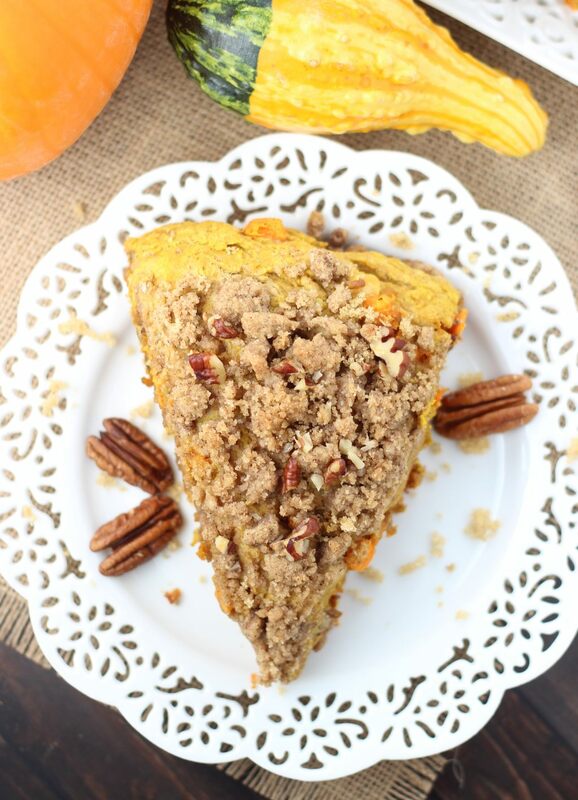 They’re full of flavor, thanks to pumpkin puree, brown sugar, spices, and chopped pecans. I also tracked down the limited edition pumpkin spice chips and threw some of those in, but they are definitely not essential if you can’t locate them. 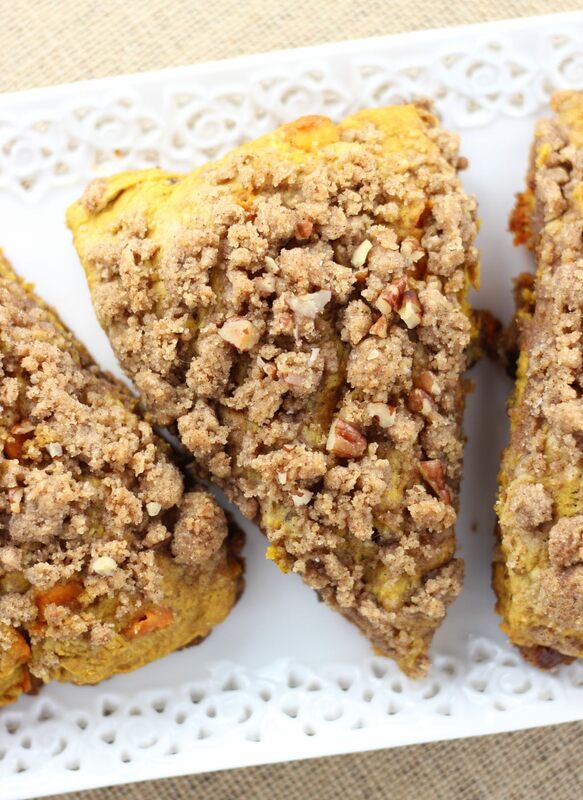 What truly sets these Pumpkin Pecan Scones with Brown Sugar Streusel apart from other scones you’ve tried is the brown sugar streusel topping. I’ve never seen a streusel-topped scone in my life, and I was proud when I came up with this idea. Even with the streusel, these scones are ready in just over a half hour, so they’re perfect for weekend mornings when you have a little extra time to prepare a nice brunch! 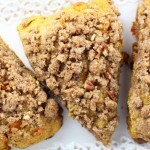 Pumpkin scones loaded with pecans, and topped generously with brown sugar streusel! In a small bowl, combine milk and vinegar. Set aside. 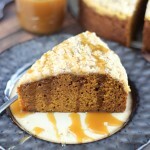 In a medium bowl, combine the sour milk, egg, and pumpkin puree. Whisk until well-blended. Add the pumpkin mixture to the flour, along with the pumpkin spice baking chips and pecans. Place the dough onto a well-greased baking sheet and flatten into a circle about 10-inches in diameter, and about ¾-inch thick. For the streusel, combine all streusel ingredients in a small bowl, and mix until it resembles coarse crumbs. Using one hand as a wall to keep the streusel onto the scone dough, sprinkle the streusel crumbs evenly over the scone dough. Keep as much of it off of the baking pan, and on top of the scones as possible. Press down lightly to press the streusel into the dough. Bake at 400 degrees for 18-20 minutes, or until edges are golden brown. 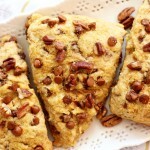 If you try these Pumpkin Pecan Scones with Brown Sugar Streusel, let me know!! I’d love to hear what you thought! Streusel on scones?! Yes please! I haven’t made scones in a while, but these sound seriously delicious! Love the streusel on top! Pinning! 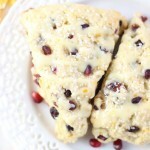 I love scones and these look amazing! These look amazing! I think they would be perfect Thanksgiving morning! 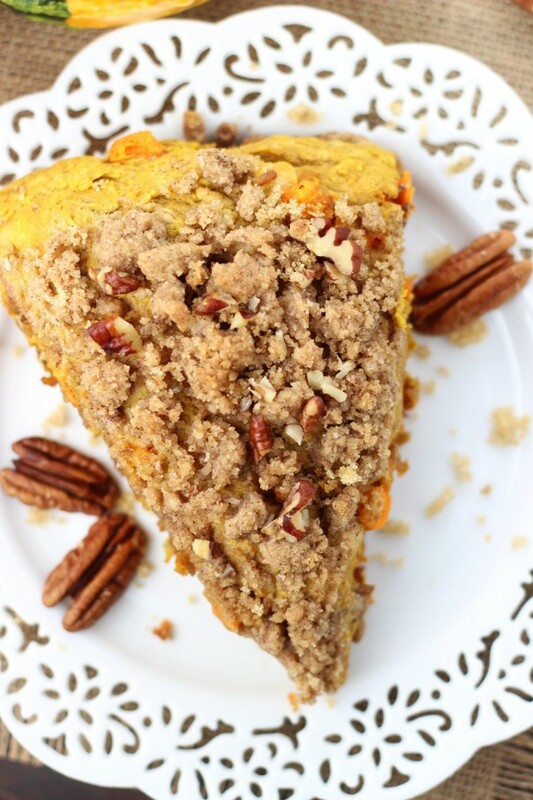 Yes, a perfect fall brunch, right? Thanksgiving morning would be perfect! That is what I call a scone. Great combination of flavors. Thanks for sharing at #Throwback Thursday. Please join us again and remember this week will focus on Thanksgiving recipes. Thanks so much, Quinn! See you at the party! Thanks for linking up at the Weekend Wind Down Party! These look scrumptious! I will have to add this to my to try list! Looks amazing. Pinned & shared. Thanks for joining the Inspiration Spotlight party. Hope you have a happy Thanksgiving! I am starting these scones, but the batter is really wet and sticky. Did I do something wrong? They shouldn’t be *really* wet. They’ll be a bit wet and a little sticky, but they shouldn’t be wet…. how did they turn out? I hope you managed okay! Mine were as well! I had to add almost 2 more cups of flour to make it even a bit more manageable. Thanks for your feedback! I’m sorry to hear that you had trouble with these. I’m going to make these this weekend so I can recheck measurements. I’ve made a lot of scones, and these should be correct, but perhaps I’ve gotten used to working with a wet dough from making so many? I don’t know, but I do want to make sure I include any notes and clarifications if that’s the case! I’ll report back. I made these and they had a phenomenal flavor! My batter was super wet and sticky as well. I couldn’t even really knead it because it was so sticky. So I’m not sure if I just mis-measured something or if the flour absorbed some of the atmospheric humidity (because according to the internet that’s apparently is a thing?). The scones were super dense and had almost like a gooey cake texture, but they had a great flavor. I’m going to attempt again and be more careful with my measurements and maybe add additional flour if it’s still sticky. Thank you for sharing! I can’t wait to try these again and actually get to experience them in their full glory! Hi Cassi! I based these from my Sweet Potato scones, and I checked over the measurements – all look right from my experience with them. Sometimes pumpkin is pretty watery, I wonder if that was part of it. 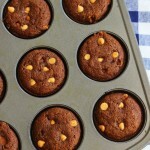 Perhaps try 3/4 c. when you make them – I’m sure they won’t be too dry with that small adjustment in the pumpkin. I’m glad you like the flavor!!! Wishing you a lovely holiday season, and I hope you have a wonderful Christmas!